Miles&Bailee were married on a beautiful winter evening at Vizcaya, a Sacramento wedding venue, just a few days before Christmas. The whole day was completely overcast yet still bright and not gloomy which made it perfectly even light for utilizing every space of their beautiful venue. The first time we photographed these two was in Chicago back in the Fall for their engagement session. We walked around the beautiful city and found great views of the iconic Chicago skyline. It was one of our favorite engagement sessions last year for sure! Like mentioned above, Miles&Bailee live in Chicago while Bailee is starting medical school. Bailee grew up in Chico and Miles in Half Moon Bay. The couple planned a destination wedding in Sacramento, the perfect in-between spot for all their family and friends. Miles&Bailee first met while going to college in Arizona. They were both out with friends in a very crowded area. Bailee noticed that Miles was wearing a Giant's hat and being a fan herself, struck up a conversation with him. After finding out different things they had in common, Miles asked Bailee to dance. From there they kept talking and soon went on their first date. 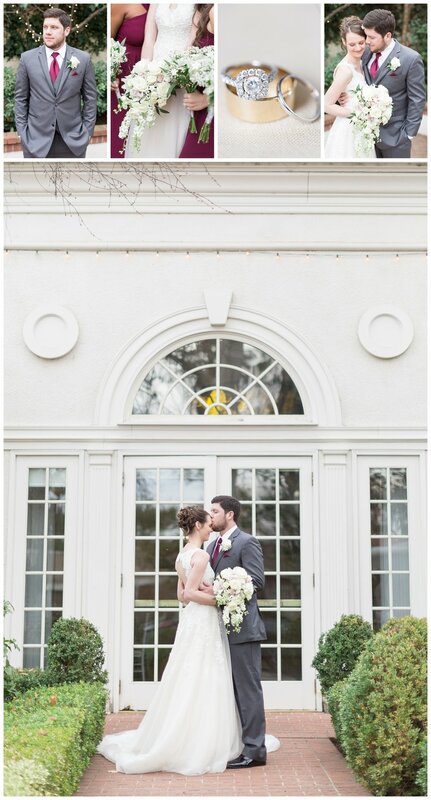 The venue these two chose was in the most charming neighborhood near downtown Sacramento. If you're wanting to get married in the Sacramento area, we highly recommend Vizcaya Sacramento, it was beautiful! They had amazing getting ready locations on site for both the groomsmen and bridesmaids. Lots of natural light everywhere which we love because it fits with our style of photography and videography well. The house that the girls got ready in also happens to be a big Bed and Breakfast which most of Miles&Bailee's family were able to stay in while traveling from out of town. In the winter time, the sun sets much sooner than during the rest of the months of the year. Since Miles&Bailee's wedding ceremony would be after sunset and in the dark, they opted to do a first look and we were able to capture all their photos prior to their ceremony starting. Some of our favorite moments on their wedding day included Bailee getting into her wedding dress. Between her sweet bridesmaids, and some additional family members, there was so much excitement in the room. Bailee looked amazing and was so eager to see Miles. Everyone in the room was raving about how beautiful Bailee looked and we wouldn't agree more. Miles and Bailee shared the most beautiful vows during their ceremony, both a perfect balance of serious and funny which shows how compatible these two are for one another. One of our final favorite moments of the night was the surprise dance Bailee and her dad did. Her mom and brother even joined in too. This caught everyone in attendance by surprise and got everyone on the dance floor and joined them afterward! What a great day! Enjoy some of our photography highlights from Miles&Bailee's destination Sacramento wedding! We also were privileged to be the videographers for this wedding! If you'd like to be notified as soon as Miles&Bailee's wedding film is released, make sure to sign up here. If you'd like to be notified as soon as Miles&Bailee's wedding highlight film is released, sign up here.